It's Fight Week! GGG - Canelo just days away! It’s Fight Week! GGG – Canelo just days away! It has arrived: that special feeling only a fight fan can possibly understand; that blend of utter excitement and nerves that comes when a big fight is just around the corner. And here, on fight week, as we brace ourselves for the biggest middleweight title fight in years, fight fans around the globe have that feeling in their bones. Saturday night’s fight between the undefeated Gennady Golovkin and the in-his-prime Saul Canelo Alvarez is, quite simply, what boxing is all about – the best fighting the very best. Who wins? This has been the debate or argument that has had fans going back and forth for the last few months, and now, finally, we are just days away from getting our answer. There have been no delays, neither fighter has picked up any injuries (to our knowledge anyway), both men have trained supremely, and now all the talking is (pretty much) over. Has the fight come at the perfect time; for us and for the two fighters? Some say Canelo, or his promoter Oscar De La Hoya, purposely waited until GGG got old, or began to look a little older as regards to his ring performances, before taking this fight. It was the struggle with Danny Jacobs in March that did it, that convinced De La Hoya to take the fight for his fighter, so the critics claim. Maybe. But Canelo, as quoted by Mail Online, says this is simply not the case, that he would have fought Triple-G even if he had done a number on Jacobs instead of pulling out a very close decision victory over the New Yorker, who, we must remind ourselves, is the second-best proven middleweight in the world today. And thankfully it did get signed, as both men won their last fight. And even if GGG has slowed, just a touch, he is still THE champ, he is still viewed as one of the best fighters, pound-for-pound today, and he is still the pick to win in the opinion of many millions of fans. Canelo understands fully well what a tough fight he is in for. It should be a great fight. Anything less and fans will be disappointed. Such are the lofty expectations the genuine Super Fights of boxing have heaped upon them these days. You are here: Home / Boxing News / It’s Fight Week! 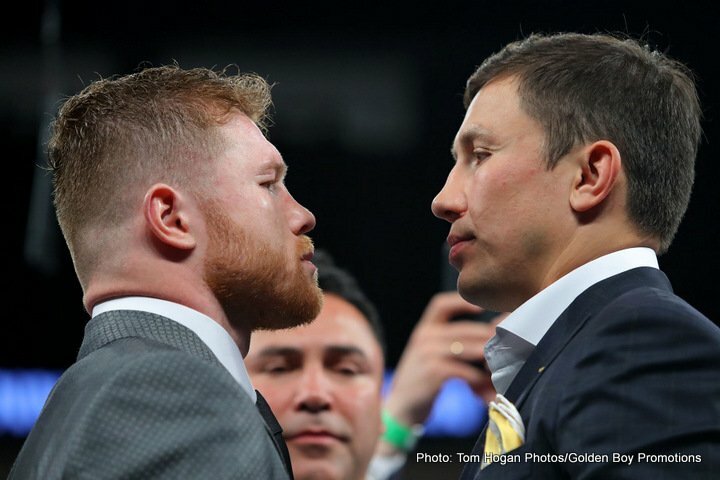 GGG – Canelo just days away!